It is commonly claimed that certain fruits (e.g. apples, bananas, high-ethylene fruits and their dastardly "ripening hormone") make other fruits ripen faster. These claims appear on mainstream media and are often repeated by experts, but they are frankly very inconsistent. Some blame polyphenol oxidase, other blame ethylene. None of them link to a serious study. What is the empirical evidence that certain fruits ripen others? Which fruits ripen which, and why? Ethylene definitely has a role in the ripening of fruit. The ripening of fleshy fruits corresponds to a series of biochemical, physiological and structural changes that make the fruit attractive to the consumer. Although these processes vary from one type of fruit to the next, fruits can be divided into two broad groups, known as climacteric and non-climacteric (Biale 1964). Categorization into one group or the other depends on whether or not a fruit exhibits a peak in respiration (McMurchie et al. 1972) and ethylene production during ripening. The sharp increase in climacteric ethylene production at the onset of ripening is considered as controlling the initiation of changes in colour aromas, texture, flavour, and other biochemical and physiological attributes. In contrast, the ripening of non-climacteric fruits is geneerally considered to be an ethylene independent process and little is known of the regulatory mechanisms underlying the biochemical changes. From this we learn that some fruits produce ethylene as they ripen, and this ethylene is a chemical signal that controls ripening. The claim that certain fruits ripen other fruits is possible if the ripening fruit transmits a significant amount of ethylene to the other fruit. The first fruit would have to emit a significant amount of ethylene gas, which would then have to be absorbed by the second fruit. The second fruit would also have to be climacteric. climacteric BOTANY the ripening period of certain fruits such as apples, involving increased metabolism and only possible while still on the tree. Climacteric fruits — those that can ripen after being picked — produce much more ethylene than non-climacteric, which cannot ripen once removed from the plant. 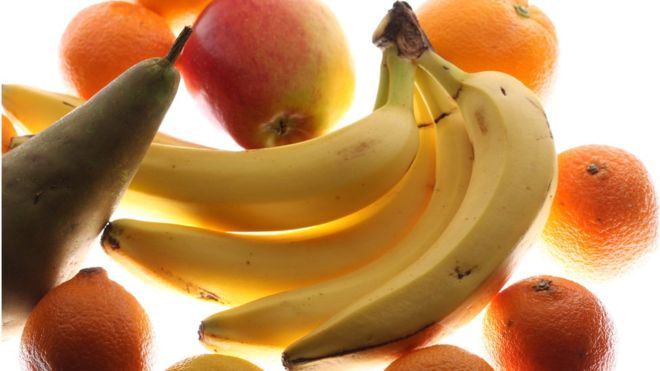 Some fruits, such as apples and bananas, produce even more ethylene gas than other climacteric fruits. If you find yourself impatiently waiting for a climacteric fruit to ripen, you can speed up the process by placing the fruit in a brown paper bag to concentrate the ethylene, or even position it near an apple or banana. After‐ripening of fruits adjusted by ethylene‐generating agents is a scientific paper that applied ethylene to kiwis and peaches. The ethylene speeded the ripening process in both. The fruit was exposed to 750 or 1700 ppm of ethylene gas. Measurement of ethylene production during banana ripening found that ethylene production from bananas fell in the range of 2-50 µL ethylene/kg fresh material/h. If I assume a 2L container, 5 average weight bananas (~1 kg) producing the mid range of ethylene gas (25µL/kg/h) could produce 750 ppm in 30 hours. This is a comparable to the amount of time it would take for things to ripen on their own, but it is quite possible that lower concentrations of ethylene still have a ripening effect. This article contains the following paragraph, which suggests that real scientists believe something similar to the claim. Principle Bananas are climacteric. This method is designed to initiate fruit ripening with an ethylene-like gas such as acetylene or propylene and to measure fruit ethylene production by gas chromatography 1. The article also cautioned that excess CO2 buildup in a container will inhibit further ripening of the fruit. If you put your fruit in too small of a container or a container with too poor ventilation, it may slow ripening. Conclusion: Climacteric fruits produce and require ethylene for ripening. More ethylene will make them ripen faster. [Sklivvz:] Guys, I'm challenging a widely repeated claim and provide a few examples. A scientific study of the ripening effects of apples or bananas is enough to answer it. I really really don't care about hearing that ethylene is ripening. It's not relevant at all. Show me an example of an apple ripening anything under experimental conditions. Biology is unsuitable exactly because I'm skeptical of the off-handed answers I'd get from a generic biologist without any specific knowledge. [Sklivvz:] I already knew that ethylene is ripening, but this is a meaningless factoid, unless the amount released is significant enough to have an effect. Surely when artificially ripening a certain amount is necessary, which is not at all guaranteed to be released by common fruits. Ethylene is biologically active at very low concentrations of around 0.01 to 1.0 part per million (ppm). Lower or higher sensitivities have been observed depending on the species and the response. Some climacteric fruits, such as tomatoes and apples, can generate tens of ppm of ethylene. Ethylene receptor inhibitors have been known and used for quite some time. The only (recent enough) studies you're likely to find on group rots are those in which the non-inhibited control is compared with inhibited treatments e.g. But if you don't trust how these inhibitors actually work (they could do anything else) then such studies are not a proof that fruits in groups rot faster than alone. It was observed by Elmer in 1931 that the presence of ripe apples and pears—but not oranges or bananas—caused abnormalities in the sprouting of potato tubers ; and Huelin pointed out that the effects were similar to those produced in potato sprouts by exposure to ethylene. Later, Smith and the writer showed that the growth of pea seedlings was affected by an active substance produced by ripe apples, again with results which were paralleled by ethylene. Kidd and West had previously noted that a substance produced by ripe apples would stimulate the so-called 'climacteric' in unripe apples ; and the writer had show that an active substance generated in traces by ripe bananas has corresponding effects on the rate of respiration and the ripening of green bananas [...]. In each case, similar results could be produced by exposure to a trace of ethylene. I don't know how well controlled those old experiments were. All the references cited there after Elmer are from a "Report of the Food Investigation Board for 1932, H.M. Stationery Office", which was a collection of papers, apparently. Dig that up and enjoy your skeptical trip down the memory lane. Alternatively, as LangLangC suggests below, look at high-school science experiments; that's the level of interest for such studies nowadays, as far as I can tell. Where the reasearch-level science/industry interest has moved is inhibition of ethylene's effects, like I said. Not the answer you're looking for? Browse other questions tagged biology consumer-products chemistry fruit livestrong . Do juicers preserve the nutritional quality of fruit and vegetables? Can an extra internal refrigerator light increase the vitamin C content of fruit? Are preservatives applied to commercially distrubted fruit? What hair-care benefits come from adding fruit or fruit-extracts to shampoo? Does stress make you age faster, biologically? Are fruits better than processed fruit juices? Is this fruit naturally shaped like a woman?